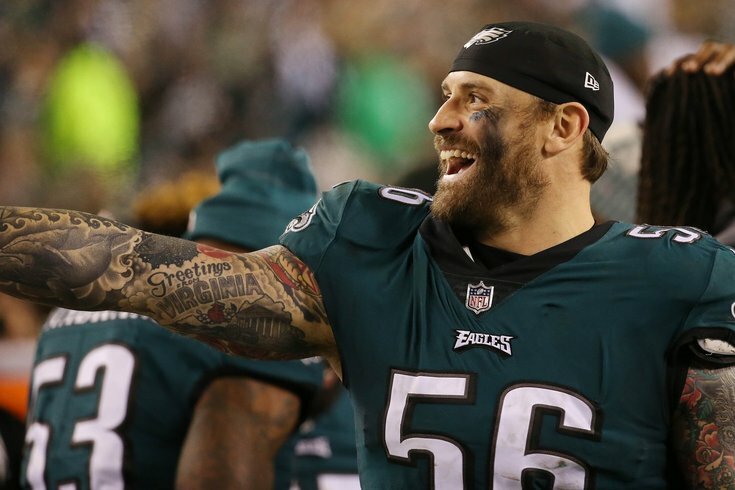 When he's not making game-changing plays in the NFC Championship Game, Eagles defensive end Chris Long has been trying to make an impact off the field. His outspoken voice and charitable acts have made waves across the country, with Long being spotlighted by people as high up as former President Barack Obama. Long has decided to use his voice and his actions to speak once again, and this time it's directed at the current Commander-in-Chief. As a guest on the Pardon My Take podcast on January 29, Long was asked whether he'd accept an invitation to the White House if the Eagles were able to overcome the Patriots in the Super Bowl. The 32-year old did not mince words. "No, I'm not going to the White House," said Long. "Are you kidding me?" This should come as no surprise to anyone who has been following Long up to this point. He has been a fairly outspoken critic of Donald Trump and made the decision to boycott New England's trip to the White House after their Super Bowl victory last season. Long participated in a video project explaining the decision alongside fellow Patriots player Devin McCourty, and stressed how his view of the long-term influenced the decision at the time. "My son grows up, and I believe the legacy of the President is going to be what it is," said Long, "I don't want him to say, 'Hey Dad, why'd you go when you knew it was the right thing to not go?'" At the time, Long dealt with a lot of criticism from people who viewed skipping the visit as a missed opportunity for a guy who has his mind set on making an impact. He shrugged off the claim, implying he'd be much more likely to show up if he thought there was a real opportunity to make a difference. They would have to actually win this game for it to become a point of debate, but there are some fascinating subplots regarding a potential White House visit for the Eagles. There is no doubt some teammates are on the other side of the fence from Long politically, but even the guys who see eye-to-eye with him might believe that "photo op" is worth showing up for. Eagles players like Malcolm Jenkins have shown a willingness to sit down at the table with people they might disagree with if only to make sure their voices are heard. You would be hard-pressed to tell Long he hasn't put his money where his mouth is on causes close to his heart. He donated his entire 2017 salary to charities in the three cities he has played for in the NFL, after pledging to fund scholarships for students in his hometown of Charlottesville, Virginia following the controversial "Unite the Right" rally in August. Put it this way: if the Eagles somehow manage to win the first Super Bowl in franchise history next Sunday, I imagine most Eagles fans won't care who shows up to the White House or not.